Two things that Petersburg has a lot of are fish and wood. And one thing the local rocky terrain is short on is dirt. But given the right circumstances you can get dirt out of fish and wood. A new business venture by the local tribe, Petersburg Indian Association, has begun to provide the town with locally-made, environmentally friendly compost. Walking on the road into the landfill, you pass by piles of automobiles and rubber tires, and eventually come to three large, white portable buildings. This is where the local tribe makes compost. In one of the tents is a large stainless steel machine that’s cylinder in shape sitting on top of a trailer. 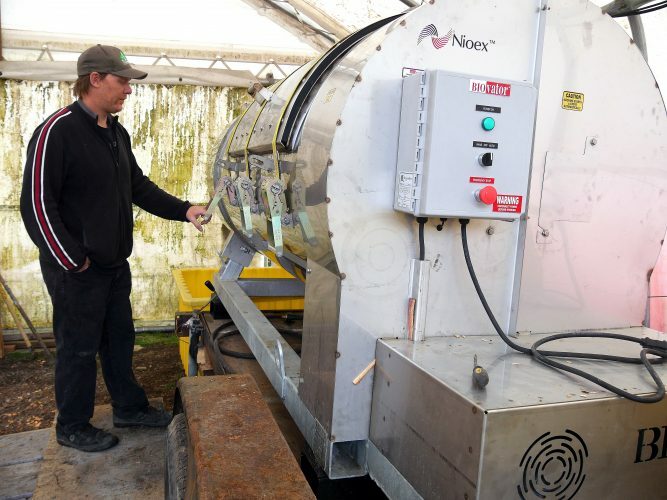 (It’s called a Nioex Biovator) The tribe paid $15,000 for it and had it shipped in this fall from Manitoba, Canada. Brandon Thynes is the Tribal Resource Director. Thynes and his assistant, Clifton Gudgel opened up the lid and he was right; it didn’t smell. It just looks like dark brown wood chips. Before working for PIA, Thynes used to be a commercial fisherman. He knew there was a lot of fish waste. It gets ground up and dumped into the water in front of town by local processing plants. Now, Thynes gets some of that leftover fish for free. The tribe uses up to 500 pounds a week for composting. “It’s a great year round business for the tribe, helping the environment by not pumping that fish waste into our Narrows,” Thynes said. If there’s a shortage of fish, Thynes said they could always use kelp. The wood they get from scraps around town that would otherwise get burned at the landfill. It’s usually alder because it grows fast and people often want to cut it back. PIA puts it through a wood chipper and its ready for composting. But they won’t just use any scraps. They have to know where it’s from and that it hasn’t come in contact with pesticides or other chemicals. “It’s not labeled organic but it is organic because we don’t add anything to it,” Thynes said. The composting machine is on a timer so it rotates every two hours. It takes about two weeks for the fish and wood to become dirt and then it needs to sit and cure for a month before it can be used. After a batch is done, they’ll filter out any leftover pieces of wood to go into the next batch. PIA has been making compost for years. In the past, the tribe used an older model composting machine that kept breaking down. Then workers made compost by hand by what’s called static aerated piles. 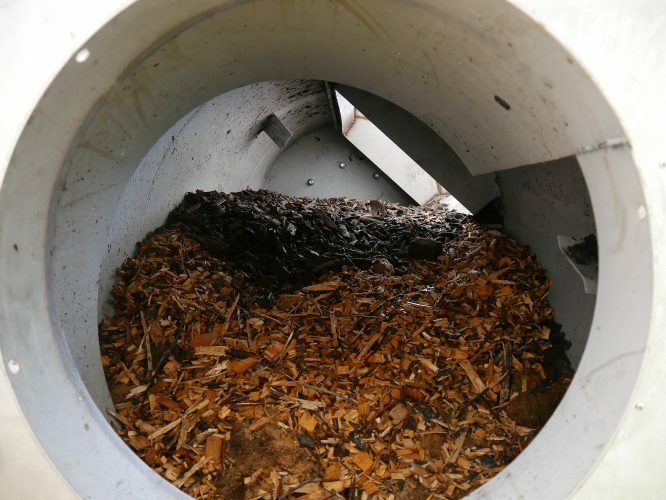 Wood chips and fish were layered in a heap on the ground, which would get aerated and turned occasionally. But the process was lengthy. And when Thynes started working for the tribe a year and a half ago, he wanted to expand. He says they were missing opportunities. Gudgel, Thynes’ assistant, said he likes having a job where he can work outside. Thynes keeps a detailed notebook of batch results, what goes in when and at what temperature. 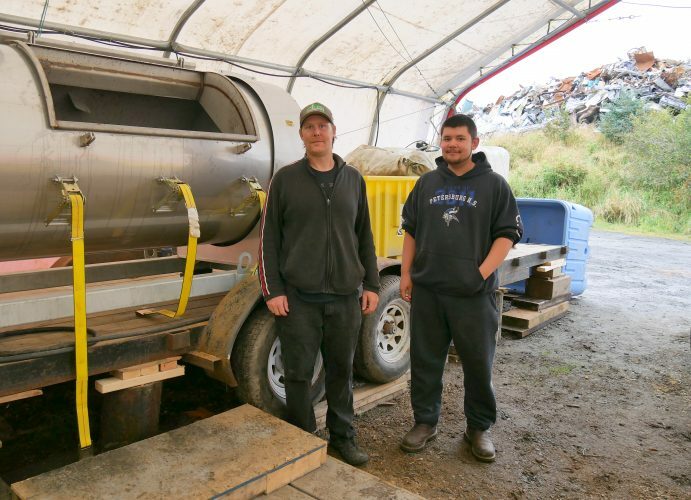 On average, this machine can produce about 40 pounds of compost a day. PIA plans to sell it in 40 pound bags within a few months. It will cost about the same price as imported compost sells for at the store. But Thynes says this stuff will be pure, local product. “You know the big companies that do it, they don’t care what they throw in there, they just throw it in, ‘Throw it in–it’s a nitrogen, throw it in–it’s a carbon,’ and people are just getting a mixed bag of who knows what’s in it but with us, you’ll know what’s in it,” he said. “It kind of looks just like dirt,” Thynes said, laughing. It’s like a fluffy, “mulchy” dirt. PIA’s composting project is funded by IGAP, the Indian Environmental General Assistance Program. Angela Denning is a reporter at KFSK in Petersburg.